The Generators come from California and were founded in 1997. Although they had been very busy and The Winter Of Discontent is already their seventh album, I wasn't familiar with their music so far. But listening to the twelve songs on the new record has been a positive experience. 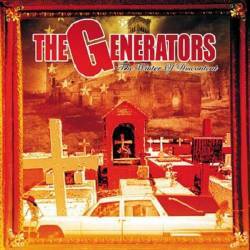 The Generators are a punk'n'roll band that sounds like a crossbreed of Bad Religion and Social Distortion. The melodic component plays an important role in most Generators songs. They really have a sense to write beautiful melodies or choruses. The opener Walking Away sounds like a Bad Religion track, only played a bit more in an old school way. There are so many beautiful songs, like Who Is Going To Save The World?, Lost In Transition and From A To Z, that can only be written on the West Coast of the United States. These are just a few songs that have the potential to become hits. Apart from the slightly boring Ten Days Away, there is no weak track on the record. The Winter Of Discontent is not only suitable for punk fans. The 50s retro sounding rock'n'roll guitar makes this record also interesting for people who prefer straighter and hard rocking music. The Generators seem to have found the right way as they get described in reviews as "the new face of punk'n'roll" or "the band of the new millennium". Another strange fact is that the Generators are sponsored by a brewery and two fashion firms.